Yes, Wegmans still had that new shovel I’ve been admiring. The metal edge will help me cut into the ice that the plow guy often leaves behind with his big blade. The straight handle will be good for throwing the snow. I like the light plastic purple bottom. Not that I’m asking for a quick snow to test it or anything. I hope it sits there. Quite content. In the house. Without having to prepare for a test. It’s snowing this morning, MBC, but not yet enough for me to move the shovel from the alcove! We got two inches overnight here in Pennsylvania. That metal bottom will help with that pile that the snow plow leaves …indeed! Yes, Nance, I’ll be better with that slush pile now! I hope you are enjoying the Pennsylvania weather. The surest guarantee that it won’t snow is to be ready in case it does. Good work, Mark. I hope we wait and wait and wait, ready, CM. Sssssh. It’s supposed to hit tonight into tomorrow morning. I hope the forecast is wrong. I am hoping it is a miss as well, CM. Oh, Mark, I’m laughing. 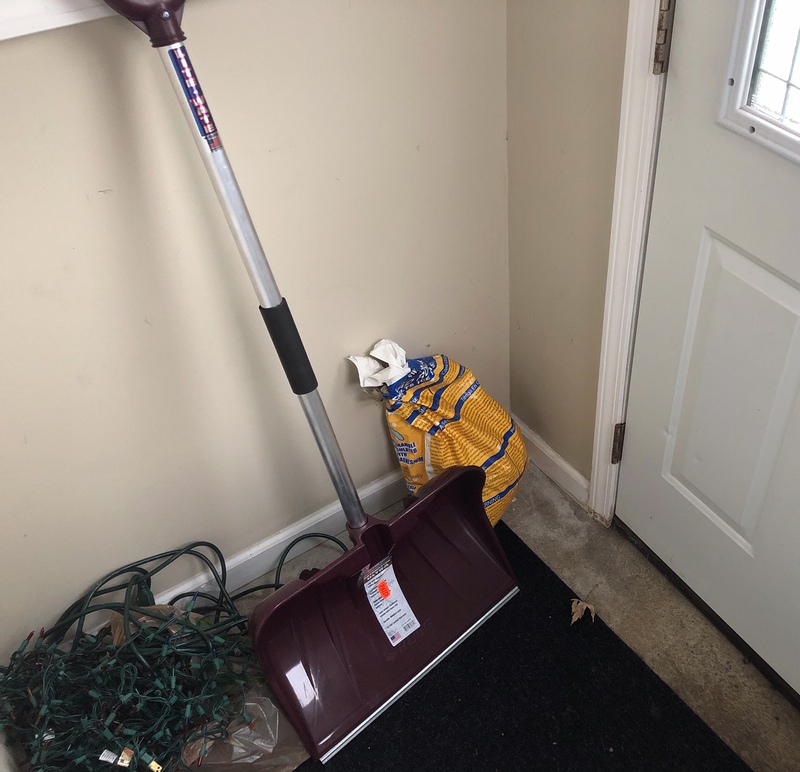 Only a guy would say “that new shovel I’ve been admiring.” I use shovels. I buy them. But I’ve never admired one . . .
your snow has met its match!!! Oh she is a beauty of a shovel Mark. And I am sure will serve you well. Have no idea what ever happened to our ‘team’ of snow shovels. What a relief to have them slipped from consciousness. Thank you for this lovely new perspective on memory loss. Some things are best put in the memory attic, JoHanna!